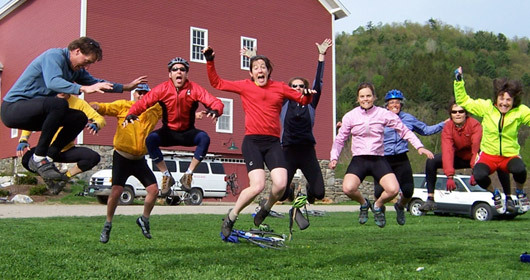 Welcome to POMG Bike Tours of Vermont, the affordable, active eco-friendly vacation that's fun! POMG (Peace of Mind Guaranteed) Bike Tours of Vermont, locally owned from its beginnings in 1995, provides cyclists and outdoor enthusiasts of all abilities with bike adventure vacation packages that run from late May to the end of October and stretch from one end of the state to the other. The Northeast Kingdom, Lake Champlain Valley, Mad River Valley and Southern Vermont are just a few of the areas POMG explores. At the center of each tour are fresh air, unspoiled beauty, and peace of mind. Breathtaking tours of Vermont scenery, quaint villages and local attractions. End each day savoring homemade specialties in the comfort of carefully selected Vermont inns and bed and breakfasts. Individualized attention catering to all abilities. POMG Bike Tours of Vermont offers a series of tours, differing in routes, levels of difficulty, and mileage. Expert guides with an average of eight years experience in the active travel industry. All leaders are trained in bike repair, first aid and CPR, and focus on client needs to provide a safe and unforgettable vacation experience. Cyclists can expect POMG, "thirteen to the dozen" service on the road and from Innkeepers who are all chosen for their welcoming hospitality and their home cooked, healthy farm fresh meals. There are 3 unique mid-week tours that cover the entire state and parts of New York. To date, clients have come from 49 states and 17 countries. "Peace Of Mind Guaranteed." This was my Grandpa Savitt's slogan from his store in Hartford, Connecticut. He taught me that there is no substitute for customer service. "Practice the Golden Rule, do unto others as you would have them do unto you..." (thanks Grandpa!) We practice the Golden Rule, you get POMG. For more on Grandpa Savitt, the original Mr. POMG, click here. Why Bed & Breakfast Bike Tours? Vermont is famous for its quaint and charming Bed & Breakfasts. For those who do not enjoy camping, the B&B experience is just the thing. We are fortunate to have a great variety of B&B's whose innkeepers have year's of experience pampering cyclists with homemade specialties and Vermont hospitality. Covered bridges, Green Mountains, wildlife, deep blue glacier-formed lakes and clear cool rivers. Country stores, antique shops and maple syrup. Endless pastures, gardens and vivid wild flowers, and most of all, unparalleled cycling terrain. Did we mention Ben & Jerry's? President Calvin Coolidge, a Vermonter, once said, "I love Vermont because of her hills and valleys, her scenery and invigorating climate, but most of all, because of her indomitable people. If the spirit of liberty should vanish in other parts of the union and support of our institutions should languish, it could all be replenished from the generous store held by the people of this brave little state of Vermont." We agree.